From where I’m sitting I can see at least a dozen things that need a regular cleaning – windows, desks, carpets, trash bins; a kitchenette with a tile floor, appliances, and dishes; a lounge with upholstered furniture, lamps, hardwood floors, etc. And if I was home I can assure you the whole place could use a once over. Lucky for me there are cleaning businesses aplenty that are looking to scour offices, houses, storefronts, medical facilities, schools, warehouses and more. The cleaning industry is diverse - some businesses focus on specialty cleaning such as windows or floors, others on general residential or commercial cleaning and yet more on laundry and dry cleaning services. Franchise businesses only account for about 10% of industry revenue – but opportunities still abound for the interested entrepreneur across all sectors. The cleaning industry can be roughly divided into residential cleaning, commercial janitorial services, specialty cleaning and laundry/dry cleaning services. In 2015 there were approximately 875,000 businesses employing about 3.5 million people. The industry as a whole is very susceptible to economic downturns and suffered through several rough years during the Great Recession; revenue fell 5.3% in 2008 and another 6.1% in 2009. General cleaning services, and particularly residential services, are deemed an expendable luxury when times are tough. However the years of economic strength since then have seen the industry bounce back, and in 2015 it generated $51 billion in revenue. This recent upward momentum can be attributed to both unemployment and office vacancy rates declining as well as a pickup in nonresidential construction activity. In other words – people have more money to spend and feel more secure spending it, and there are more offices that need cleaning. Strong economic activity is forecast for the next 5 years as well, and the Bureau of Labor Statistics is predicting job growth of about 6% from 2014 levels to 2020. It is estimated that the average cleaning company loses up to 55% of their customer base every year due to poor service. As one business owner states – good work goes unnoticed for years, but a bad job gets you fired immediately. Competition is fierce – there are many small companies competing for both residential and commercial cleaning contracts. Barriers to entry are low as there is very little expensive equipment needed and little to no training required for employees – so new competitors spring up all the time. For dry cleaning and some specialty cleaning services, however, expensive equipment actually can be a significant hurdle, including needing commercial or industrial real estate to sell and perform services. The best franchise opportunities are likely to be in specialty cleaning services that have a greater opportunity to differentiate themselves and are less likely to face local competition (if the proper business is selected of course!). Marketing, reputation and location are all key. Cleaning businesses are most successful in urban or suburban locations with a higher than average level of affluence. And according to the Worldwide Cleaning Industry Association green cleaning is “a marketplace phenomenon that is being driven by customer demand and the overall trending of the broad marketplace for environmentally preferable products and services.” Both home and business owners are increasingly conscious of the chemicals used in their space, and cleaning services that focus on non-toxic supplies and processes have been gaining in popularity. This is particularly true for dry cleaning – a segment of the industry that has struggled over the last decade as clothes are becoming easier to care for. Check out some of the franchise opportunities below! Demand for house and apartment-cleaning services is most popular with people of higher than average wealth looking for a little more free time – especially in two-income households. Market research suggests that the ideal target for clients are married couples with college degrees, 45 years old or older. 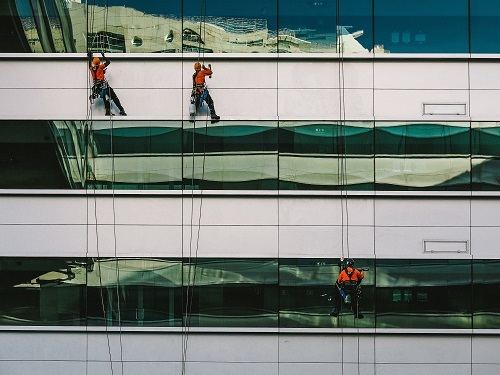 Often referred to as janitorial services, the commercial cleaning industry thrives when office vacancy rates are declining and nonresidential construction activity is picking up. Office cleaning accounts for approximately 31% of industry revenue, and most of these businesses work the 2nd or 3rd shift when offices are empty. These types of companies focus on specific types of cleaning – windows, floors, carpets, industrial and more, and they may be a bit more recession resistant if they offer a service not easily performed without special equipment or training. Window Genie, Window Gang, KEI, Dr. Glass - Windows! GreenLife Carpet Cleaning, Green Mop - Green cleaning! Self-service facilities, wash-and-fold service and dry cleaning businesses are typically family-owned and operated, though there are some bigger chains. There are approximately 33,000 businesses in this segment with revenue of about $11 billion in 2015. Dry cleaning businesses have suffered in recent years as clothing has become easier to care for – but some innovative models and specialty offerings such as green cleaning are showing promising growth. You can see cleaning franchises expanding in your area here. The Business Services industry encompasses a wide range of services. Many of these services can be purchased cheaper and/or with higher quality through outsourcing. Some examples of these services include staffing, direct mail, shipping and printing. The travel industry is comprised of several different segments including hotels and other lodging as well as travel agencies. Within lodging there is a wide range of lodgings from high class full-service hotels, to no-hassle business motels, to resorts and campgrounds. Travel agencies coordinate flights, lodging, cruises and other types of trips to both retail and business customers and can be conducted at offices or out of the home. Partnerships between hotels and travel agencies are often crucial to the success of both.